For Christmas a few years ago, I received two biographies by Wil Wheaton. Yes, THAT Wil Wheaton. Wesley Crusher himself! I also discovered his blog. And then his Twitter…and then Facebook. Makes me look like a stalker, doesn’t it? But no, I’m not. He puts himself right out there, just like the rest of us! 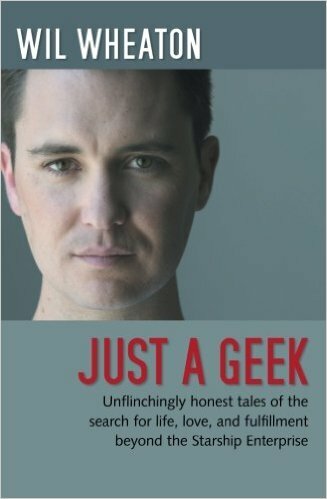 So, I started with Just A Geek: Unflinchingly honest tales of the search for life, love, and fulfillment beyond the Starship Enterprise. Wow, that’s a freakishly long title. We’ll call it Just A Geek from now on. It’s a collection of some of the posts from his blog, but with updated info and commentary by him. Now, you may only know Wil Wheaton as an actor. But I’ve discovered that Wil is also a great storyteller. I started just reading his blog, jumping around seeing what he has been saying over the years. He is funny and smart and he can definitely make you all teary-eyed when he wants to. My favorite part of Just A Geek is when Wil looks back on his old blog posts with a new perspective. Time changes things. He looks back and see events very differently. Sometimes he had to wait until years later to understand what was really happening. And other times, you learn that the real story wasn’t really told in the first place. Looking back on his life helps him come to terms with what really happened and share the truth with his readers. Yes, there are some Star Trek stories in there, which made the Star Trek fan in me squee. And yes, he is quite the geek, another plus from the geek in me. If you want to continue reading more stories based on his blog, he has continued them in two more books – Dancing Barefoot and The Happiest Days of Our Lives. If non-fiction or autobiography isn’t your thing, he also writes fiction. I recommend starting with The Day After and Other Stories, a collection of his short stores. I can’t wait to see what he comes up with next! This story made me grin and giggle like the little geek I am. I want to read his stuff now, and I’m a fiction-reader!